Accessorizing is an important aspect of dressing up, and they can make a huge difference in your appearance. It also tells volumes about your personality and gives you a complete look. Watches are one of the most important and popular devices among men’s accessories. A great looking watch is a must have in your wardrobe as they accentuate your appeal in ways you can’t even possible imagine. While investing in watches, you should definitely look for value for your money and choose from reputed brands, especially famous and top Swiss watch brands. Today we will bring you a list of best watches under 200 dollars. And this article will help you choose the right watch for a modest budget by listing the best watches under 200. Now, lets go through this best mens watches under 200 list and find the most suitable one for yourself or as a gift. Features and Pros: 1. Expensive looks at a price that is not expensive. 2. Classy and elegant looking watch which is suitable for almost all kinds of occasions. 3. Build quality is top notch, and the overall finish is superior to many of the higher end and expensive watches. 4. A water resistance of 200M that will allow you to play water sports while wearing the watch. Invicta is a brand which has gained worldwide fame and respect thanks to its superior quality timepieces that also come in a modest price range. Their watches are stylish, eye-catching and are masterpieces of innovative design. 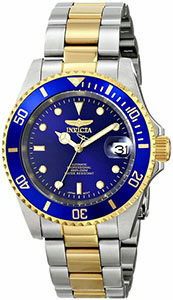 Invicta Men’s 8928OB Pro Diver Two-Tone Automatic Watch is no different. And while coming at a modest price, it is on par with models at way higher price ranges as far as design and build quality is concerned. The watch features a corrugated unidirectional bezel and luminous markers and hands that look absolutely stunning. There is also a magnified date window at 3 o’clock for added convenience. The 40mm stainless steel case is plated with 23k gold and comes with a mineral dial window. And a highly reliable and precise Japanese automatic movement is also featured in the watch. The bracelet of the watch is of golden and stainless steel tone and comes with a fold over clasp which has a safety closure. Additionally, the 200m water resistance will allow you to go swimming and play water sports while wearing the watch. In our opinion, it is the best watches under 200 dollars. So it takes the first spot in our list. Features and Pros: 1. State of the art, ultra modern looks that is sure to attract attention and fetch compliments. 2. Trust and guarantee of Casio, a brand which is renowned for its technological innovation and reliable service. 3. A great display that will allow you to read the screen in very low or high lighting conditions. 4. Powered by solar, don’t need replace batteries. 5. Water resistant to 660 feet (200 M). 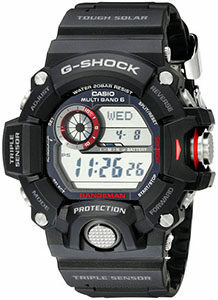 For over 25 years, Casio’s G-SHOCK series watches have been the ultimate tough watches. They are designed to withstand the most challenging conditions and still function optimally. G-SHOCK watches come packed with all sorts of technological masterpieces and convenient features that make it an ideal watch for travelers and adventure enthusiasts. Casio Men’s GW-9400-1CR Master of G Watch is solar powered and is made of stainless steel having multiple displays which have red contrasts and textured pushers. Features and Pros: 1. Elegant and modern looks and can go along very well with all kinds of attires. 3. Superb build quality and trust of a reputed brand like Citizen. 4. Very comfortable on the wrists and the dial size is ideal for most of wrist sizes. 5. Water resistant to 200 m (660 ft). Citizen is a brand that is no stranger to success in the watch making business. And it is one of the most recognized brands in the industry today. This is a brand that integrates a comprehensive manufacturing process right from the creation of individual components to the final assembly of a watch. 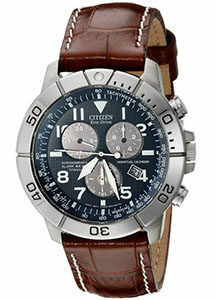 Citizen has a broad range of watches ranging from simple analogs to complicated chronographs. Citizen Eco-Drive Men’s BL5250-02L Titanium Watch is a classic example of the modern design that the brand incorporates into its timepieces. It features textured chronograph subdials that look ultra stylish and unique. The croco embossed leather band having contrast stitching is yet another feature that sets this watch apart. The Japanese Quartz movement and protective mineral crystal dial window are durable and sturdy. This watch also has a number of convenient features including a tachymeter inner chapter ring, alarm feature, unidirectional bezel and a classic buckle closure. And there is a date window at 4 o’clock position. It is also water resistance to 200m. This makes you can do some serious water sports while wearing it. You’d be making a mistake if you ignore this watch when you are looking for best watches under 200 dollars. Features and Pros: 1. Elegant and classy watch with a reasonable price. 2. It can go well with a large variety of looks. 3. Don’t need change batteries cause it is powered by solar. 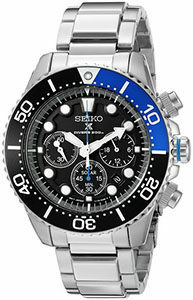 Seiko is a reputed and well-known name in the watch making industry. And this brand has been on the market for over a century now. It has consistently surpassed the consumer’s expectations by delivering high-quality products. Seiko Men’s SSC017 Prospex Solar Dive Watch is no different and features all the great qualities that a watch by Seiko has. The watch has a solar power bracelet and a contrasting black dial featuring luminous hands and markers along with 3 chronograph subdials. The 43mm stainless steel case and Hardlex dial window are strong and durable, guaranteed to last long and stay scratch free. It also features a precise and accurate Japanese quartz movement. Additionally, the 20mm stainless steel bracelet features a fold-over clasp along with a double push button safety. The water resistance of 200m will allow you to hit the pool or do some professional marine activity and serious surface water sports with this watch on. In a word, this watch is a must have in our list of best mens watches under 200 dollars. Features and Pros: 1. Straightforward and minimalistic design but elegant at the same time. 2. The brown leather and contrasting gold toned dials give a luxurious and expensive feel to the watch. 3. It is very versatile you can wear in all kinds of occasions. 4. A 30m water resistance to protect your watch from moisture. Daniel Wellington is a brand that is relatively new to the industry but has nonetheless managed to gather immense popularity. A lot of the success has to be attributed to their stunning looking products that are a blend of elegance and class. The designs by this brand are most often very plain and simple as is the case with this watch. Daniel Wellington Men’s 0106DW St. Mawes Stainless Steel Watch features a white colored dial that has gold-tone hands and index hour markers. The gold and white colors give a brilliant look and rich feel to this watch. This watch has a 40mm rose gold case with a highly durable mineral dial window. It is very beautiful and easy to read. A reliable quartz movement in this analog watch featuring a 20mm brown leather band and a classic buckle closure is totally worth your money. The leather band is very durable and comfortable to wear. And the water resistance of 30m makes sure your watch is protected from minor water spillages and brief immersions in water. 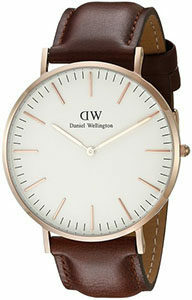 For more Daniel Wellington watches, click to see Top 5 Daniel Wellington Watches Review. Features and Pros: 1. Has a very elegant and expensive look at a low price range. 2. Reliable Quartz movement and trust of a reputed brand like Tommy Hilfiger. 3. It is perfect for semi-formal occasions. 4. Water resistance of 50m (165 ft), which will allow you to swim while wearing this watch. When it comes to great looking and modern watches, Tommy Hilfiger is the brand to look at. Their timepieces are also moderately prices. 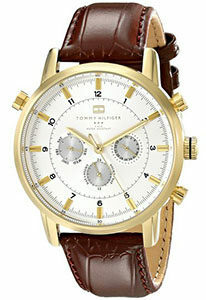 Tommy Hilfiger Men’s 1790874 Gold-Tone Watch looks very royal and classy with the brown leather and contrasting gold-tone case. The watch features a round dial with the Tommy Hilfiger logo at 12 o’clock position and hour markers in Arabic numerals. It also features three sub dials which look pretty aesthetic and give the watch a modern look. It has a 44mm case and a 21mm leather band. A highly reliable quartz movement in this analog watch is very precise. The leather croco-embossed calfskin band looks amazing as it gives a contrasting effect with the Gold-Tone case. Additionally, the band has a classic buckle closure for optimum comfort to the user. It is also water resistant to 50m. This makes it suitable for short periods of recreational swimming, but not for diving or snorkeling. So if you are looking for a high quality and expensive look watch, this one can be one of your choices. Features and Pros: 1. Great looking watch with bold design and elegant details at a reasonable price. 2. Has a very rugged and sturdy look that’s perfect for people who are looking for masculine watches. 3. Can complement both formal and casual attire. 4. The double-digit Arabic numeric looks well in combination with the dial. 5. A 100m water resistance which will allow you to swim with the watch on. Nixon is a very reputed maker of watches that offer an exceptional value for money. 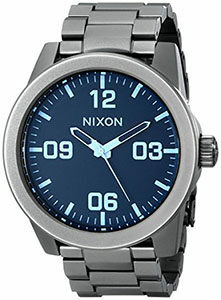 The Nixon Men’s Corporal Stainless Steel Watch is yet another quality product by this brand. The watch features a round solid tone dials and has double-digit Arabic-numeral hour markers and stick indices. The 48mm stainless steel case is not only aesthetically pleasing but is also very sturdy and durable. In addition, it comes with a mineral dial window. You are assured clear visibility in proper lighting and protection from scratches. The ruggedness of the watch comes mainly from the 24mm stainless steel three-link band. The band has a single push button safety, and a micro adjust closure which is very easy to use. Analogue display with very accurate and precise Japanese quartz movement is also featured in this watch. The 100m water resistance protects the watch from moisture even when you’re swimming. If you want to go snorkeling and swimming, don’t hold back. Just dive in and have fun without any worries of your watch getting damaged. For more Nixon watches, click to see Top 6 Nixon Watches Reviews. Features and Pros: 1. Stunning aesthetics, skeleton dial makes it look way more expensive. 2. Robust build quality and trust of a reputed brand like Stuhrling. 3. A threaded exhibition case back reveals the complicated mechanism that goes into making this watch. 4. Don’t need battery cause it features automatic self-winding movement. 5. 50m of water resistance which will protect your watch from damage caused by moisture. Stuhrling has always been known for their exquisite and highly modern looking watches that are of top notch build quality. This is a brand that delivers you with some stunning timepieces on a limit budget. 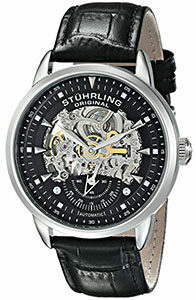 Stuhrling Original Men’s 133.33151 Executive Automatic Skeleton Watch features a round black skeleton dial that has silver markers and a sub dial displaying the seconds at 6 o’clock. The 44mm stainless steel case which comes with a shatter resistant Krysterna crystal dial window looks marvelous. And the crystal dial window not only makes it easy to read but also protect the watch from scratches. The 22mm leather band is durable and very comfortable to wear. It also has a buckle closure which is very easy to use. The automatic self-winding movement is another great feature of this timepiece, which is highly reliable as well. It is actually powered by the motion of the wrist of the wearer. So you don’t need replace batteries any more. But it requires about 8 hours of usage per day to function properly. Further more, it is water resistant to 50m, you can wear it for short periods of recreational swimming. For more Stuhrling watches, check out our Top 6 Stuhrling Watches Review. Features and Pros: 1. Beautiful design and good looking with affordable price. 2. Brown leather combined with the Chronograph dial gives it a very modern and trendy look, ideal for casual occasions. 3. The underside of the leather band is very soft and very comfortable to wear. 4. Water resistant up to 100M that will keep your wrist wear safe from moisture even when you’re swimming. Fossil is a brand that needs no introduction as they are among the most reputed and trusted watchmakers in the industry. They have a huge range of watches that are always of reliable quality and stunning looks. 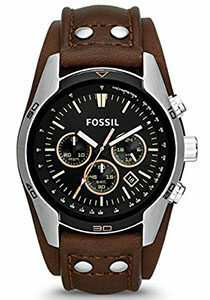 Fossil Men’s CH2891 Coachman Chronograph Watch is a classic example of the casual and modern designs of this brand. The 44mm stainless steel case along with the mineral dial window is not only sturdy and durable, but also adds to the aesthetics of this watch. The sporty looking black dial has a tachymeter along with three subdials. And there is a date window between 4 and 5 o’clock. A highly reliable and precise quartz movement is provided which is guaranteed to stay accurate. What makes this model score high in the looks is the double layered leather band. It has silver-toned studs and feature a buckle closure. The brown color of the band gives the watch a very sophisticated look. And it can go along very well with any casual or semi-formal attire. Additionally, the 100m water resistance also makes sure your watch stays safe from moisture. This watch deserves a place in our best watches under 200 list. For more Fossil watches, check out our Top 5 Fossil Watches Collection and Reviews. Features and Pros: 1. Simple yet stunning looks which are sure to fetch you a load of compliments. 2. The black stainless steel watch can go with almost all kinds of outfits and thus is a very versatile option. 3. The latch mechanism is very firm and fits perfectly on your wrist. 4. Water resistance of 99 feet which will protect your watch from moisture but not suitable for swimming. 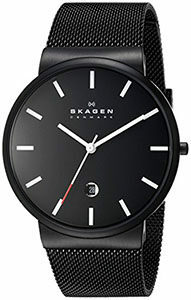 Skagen is a brand that is well known and respected for their minimalistic yet stunning and elegant designs. This brand combines the timeless design principles with modern innovation and comes up with unique products. Skagen Men’s SKW6053 Ancher Watch features a mesh band with the tonal dial and has white baton hour markers. The black dial and the white hour markers give a gorgeous contrasting effect to the watch and increase its aesthetic value. It features an analog quartz movement that is highly dependable and accurate. The black steel mesh band has an adjustable fold over clasp that is sturdy and fits perfectly on the wrists. The mineral crystal dial window looks elegant and classy. Its bold black color goes well with most types of casual and formal outfits. And there is a date window at 6 o’clock. The 99 feet water resistance will protect your watch from minor water spillage and brief immersions in water but is not suitable for swimming. If you are looking for a simple and stylish watch, this one can be your choice.